22 September, 2018. It was a Saturday. In any game you will have a degree of control. When you are a noob, you have little or no control. As you start getting a hang of it you will have increased control until you achieve full mastery and full control. The most delicate situations is when you have no control or full control. That’s when you are most likely to quit the game. 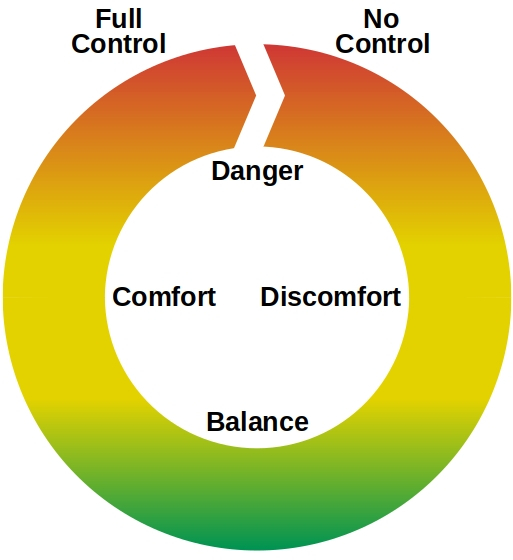 When you have little control, you will feel discomfort. When you have much control, you are comfortable. When there is a balance you will experience a fun game. Fun requires the balance between comfort and discomfort. A game is not fun if you have little or no control. Nor is it fun if you have much or full control. If you look at life as a game, you will see the same. Life is uncomfortable when you have little say in what happens to you. It is comfortable when you are in the driver’s seat. But really, it isn’t actually fun until you can feel the thrill of letting go of all that acquired control. When you master your life, it becomes boring. And people are in danger of giving up the game of life if they either feel they have no control or full control. Most people are to a certain degree obsessed with mastery, only to discover the games they play are becoming dull. That’s when it’s important to find new challenges and not subside into comfort and then into the danger of uninspiring mastery. Life requires thrills to keep it interesting and purposeful. If you feel you’re mastering your job, your hobbies, your life - let some parts go and throw yourself into something that is uncomfortable. Then feel the excitement of the ride while you grapple with situations you don’t control. Then you can feel sorry for the control freaks. Or you can inspire them to letting go.